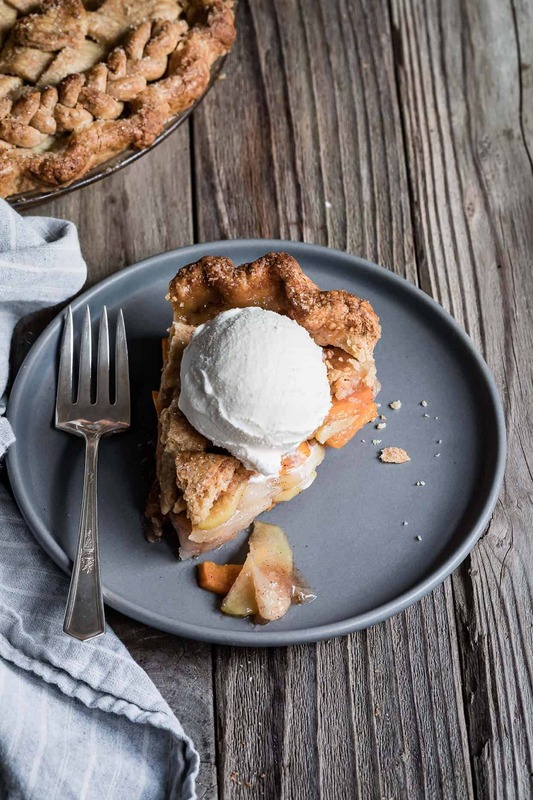 This vanilla bean pear persimmon pie deserves a feature on your holiday dessert table. 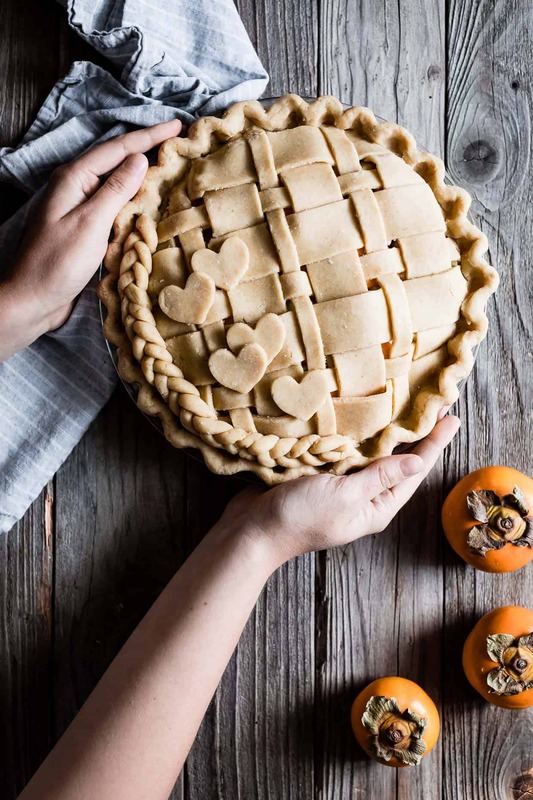 Warm spiced pear and persimmon slices flecked with vanilla bean nestled into a buttery flakey vanilla gluten-free pie crust – in collaboration with Rodelle. Best served with a scoop of vanilla ice cream. I’m in charge of pie at Thanksgiving. This year I’m mixing up the dessert table with an extra-flakey gluten-free double-crusted pie. 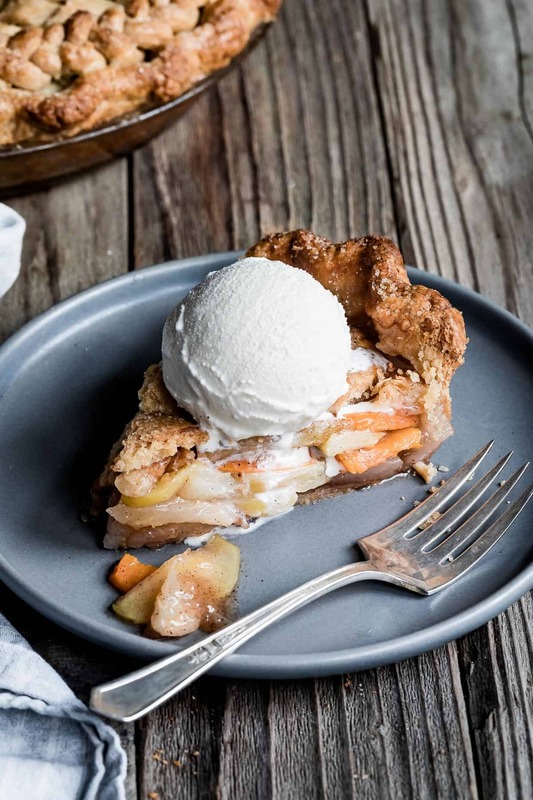 We’ll be serving scoops of vanilla ice cream over this vanilla bean pear persimmon pie. While I make pie dough all the time, I almost always turn it into galettes or hand pies. What if I spent hours on decorative top crust and it sunk into the fruit during baking, turning the whole thing into soggy soupy buttery mess? I have pie nightmares. So, this is my first attempt at a double crust pie (pulling lattice and embelleshment inspiration from pie crust master artists, Kayley & Michelle). Since a double crust pie gives you that much more crust in each bite, I jazzed up the crust by adding a splash of Rodelle vanilla extract, which in my opinion makes it taste just a bit like a waffle cone in the best way possible. For the filling, I prefer the deeper complexity of the sweetness of baked pears over apples – ever so sweet but without the tart edge. In a seemingly more-elegant kind of way. 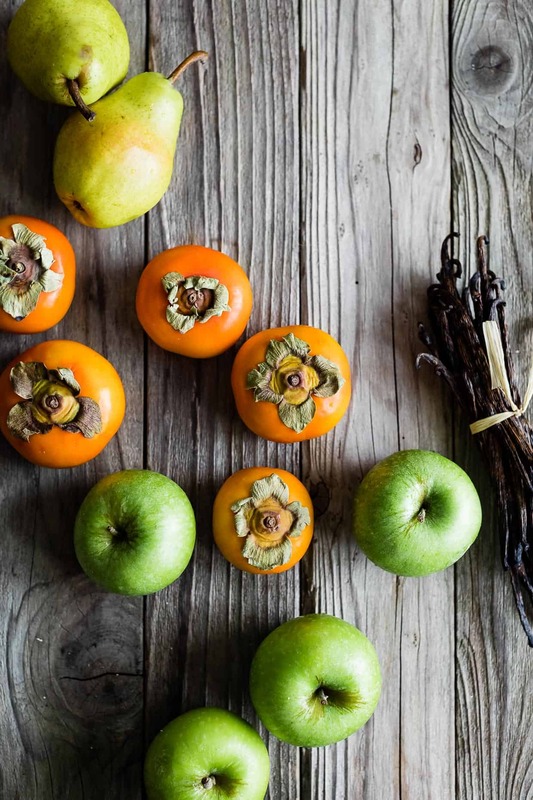 Here I’ve combined them with ripe fuyu persimmons with their rich honeyed sweetness that pairs well with the slightly floral notes of the pears. It’s all flecked with Rodelle madagascar vanilla beans and spices for a warm fall aroma. This pie gets a double dose of vanilla. 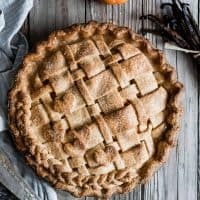 The trick to baking a pear pie is to mix in some apples to add structure and just a little bit of tartness. Pears bake down smoother and softer than apples, so it’s important to choose ripe but firm pears to keep them from breaking down entirely in the oven. The first time I tested this pie, I pulled my crust recipe from the hand pies on my blog. I doubled that and carefully sculpted the lattice. With 24 tablespoons of butter in the dough. That should have been a tip off, right? Don’t get me wrong, it was still delicious because – did I mention vanilla-scented waffle cone? It was also extra thick because it turns out my hand pies recipe was actually 1½ times my standard pie crust recipe, which means I’d just made a double crusted pie out of the equivalent of three pie crusts. To be honest, it took me a full day to realize the mistake. 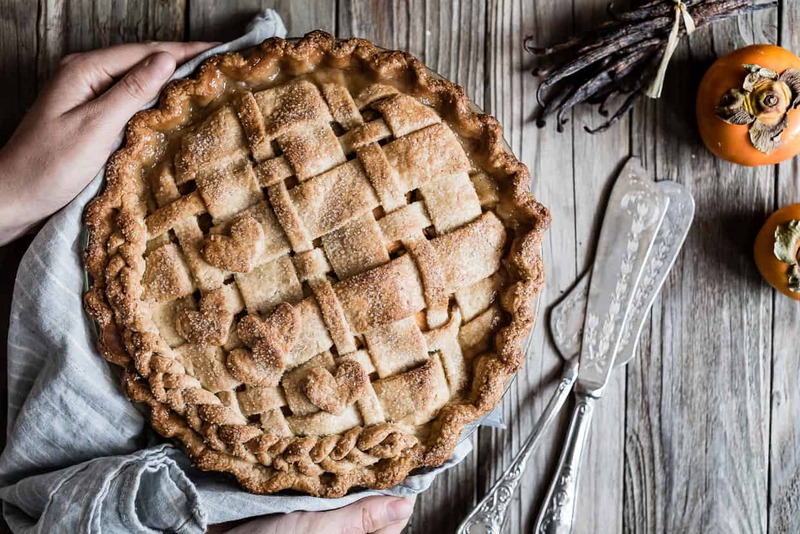 The crust was that good – Lucas even exclaimed “I always thought I hated pie crust as a kid, but it never tasted like this!” With butter folded up in layers, it’s extra buttery and flakey. And the vanilla addition makes it taste like how an ice cream shop smells. Because of the quality of their beans and vanilla and the ethics of the company (which you can read more about here), I am brand loyal to Rodelle. I buy their vanilla beans and extract at Whole Foods, but you can use this link to find where it’s sold near you. 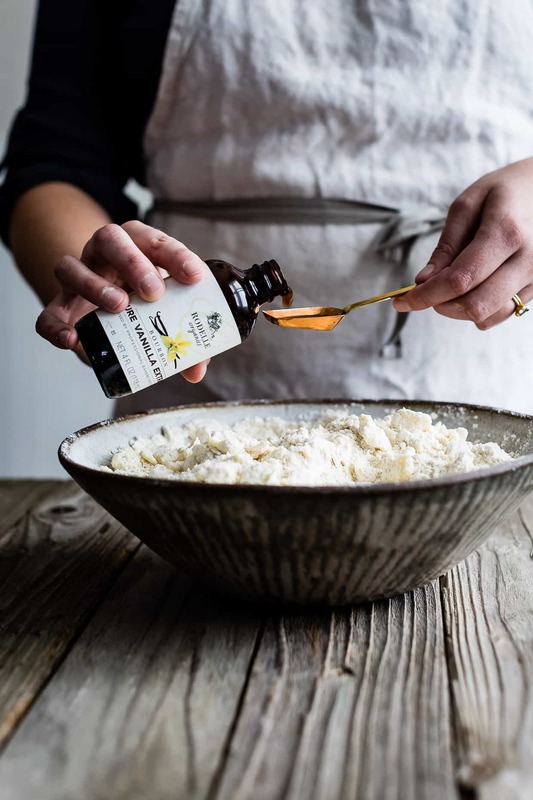 Whisk together the oat flour, millet flour, sweet rice flour, tapioca starch, sugar, xanthan gum, and salt in a large bowl. Add the cold butter and mix with your hands, breaking up the butter until the largest pieces are about the size of a almond. Drizzle in the vanilla. 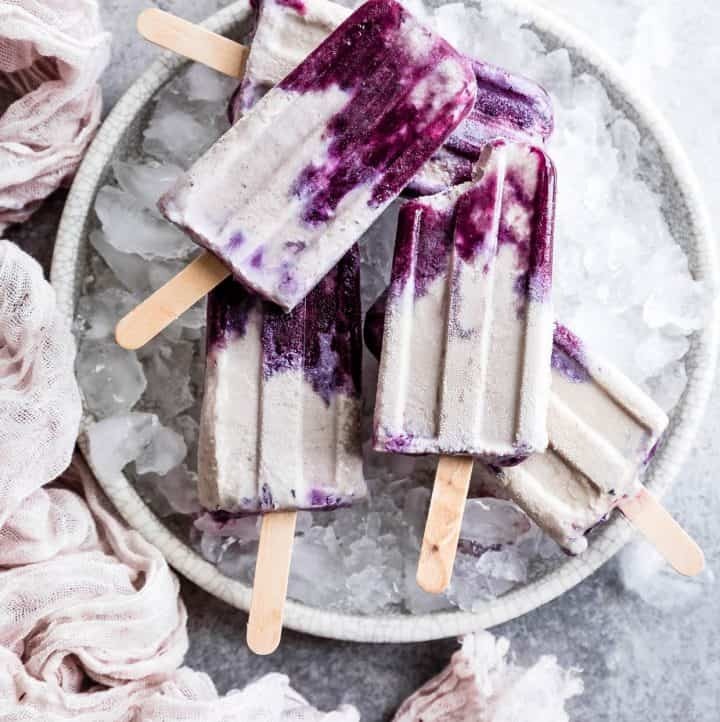 One tablespoon at a time, dribble in the ice water, combining each time, until the dough holds together when pinched with your fingers (add water until it just holds together, but is not sticky. If you need more water, add a teaspoon at a time). Knead the dough until it comes together. Divide into two equal portions. Dust your work surface lightly with millet flour and roll each piece out into a 3/4-inch thick rectangle. Dust the top of the dough lightly with millet flour and Fold the dough into thirds like a letter and then in thirds once again to form a square. Press the dough to form a circle about 1-1/2 inches thick. Wrap each round in plastic and chill for an hour or overnight. Dust a piece of parchment paper lightly with millet flour. 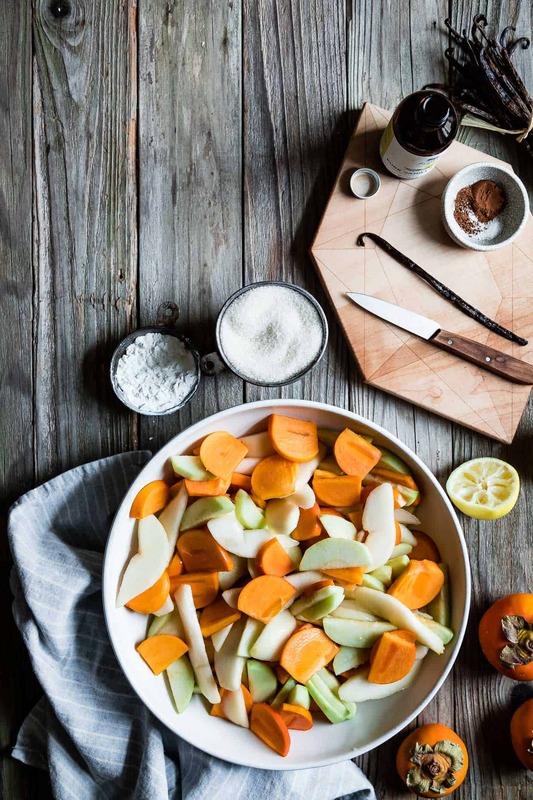 Remove one portion from the refrigerator and let sit for 5-10 minutes to soften. Carefully roll into a 12-inch round circle on the floured parchment paper, dusting with millet flour and flipping to keep it from sticking, and repairing any cracks as you roll. Carefully lift the round into a 9-inch round pie pan and trim to leave only a 1-inch overhang around. Save the scraps in plastic for decorations. Prick the bottom all over with a fork and chill while you prepare the filling. Remove the second round of dough from the fridge onto another lightly-dusted piece of parchment paper to soften slightly while you toss the filling together. Preheat the oven to 425ºF and place a rack on the bottom third of the oven. Line a baking sheet with parchment paper and set aside. Toss all the filling ingredients together in a large bowl. Pour the filling into the chilled pie crust. Roll the second round of dough into a 12x14 inch oval about ¼-inch thick and slice it into 11 long 1-inch wide strips (1”x14”). Cut 3 of the 1-inch wide strips into 1/2-inch wide strips. Alternating wide and narrow strips, use every other cut strip from your oval to place half the strips evenly spaced lengthwise on top of the pie then weave the remaining strips in one at a time (here's a video on how to do the weaving!). Trim the strips to only a ½-inch overhang, saving the scraps for decoration. Fold the edge overhang of the crust over itself and the lattice edges, using your fingers to flute the crust (alternatively use a fork to add pattern to the crust edge. 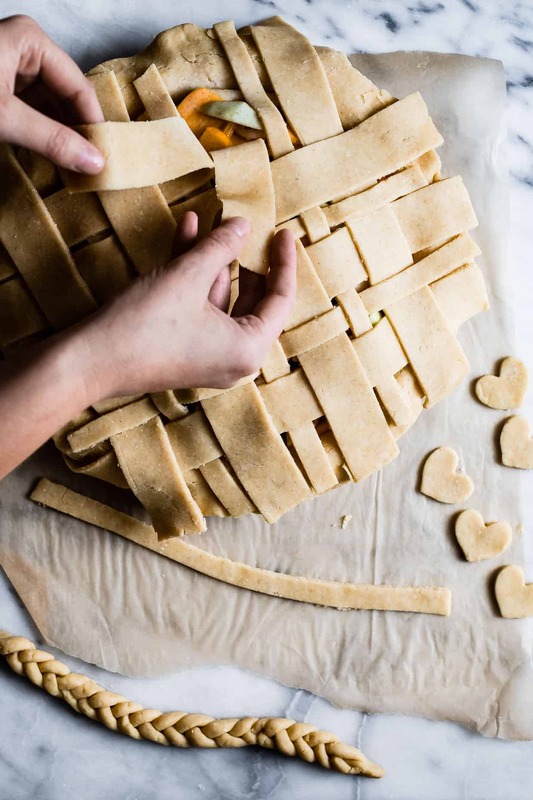 Optional: Roll the remaining dough scraps out until it is ¼ inch thick and use a cookie cutter to cut out shapes to place on top of your pie, or roll any remaining bits of dough into long strips and braid them. Place them on top of your pie as you desire. Chill the pie for 20 minutes then brush with whole milk or cream and sprinkle with coarse sugar. 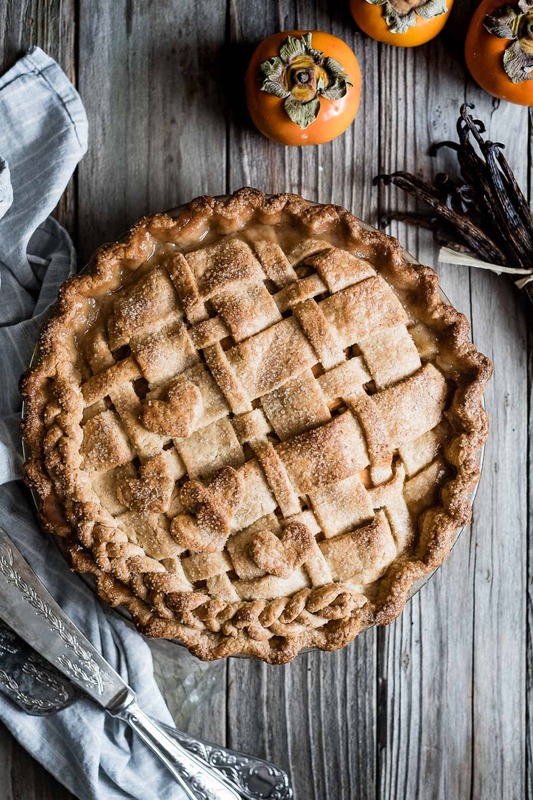 Bake the pie on the parchment-lined baking sheet on the lower rack at 425°F for 10 minutes then reduce heat to 385°F and bake for 45-60 minutes, until the filling is bubbly and the crust is golden brown. I can’t BELIEVE this is your first double crust pie!! It’s amazing! You should see my first double crust pie. It was a mess! So glad it was not recorded for posterity. I LOVE the idea of adding vanilla to the crust! Waffle cones ftw! 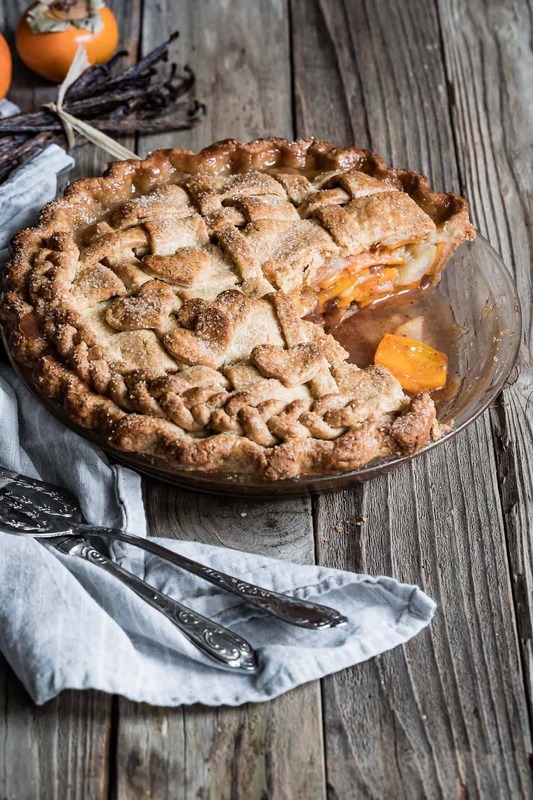 The first fruit pie I ever tried…..it was wonderful….did not serve with vanilla ice cream….so my husband insists I make it again and keep to the recipe this time….first time to have persimmons…we have been missing out on a wonderful fruit. This looks incredible! I love the little braid addition to the crust! 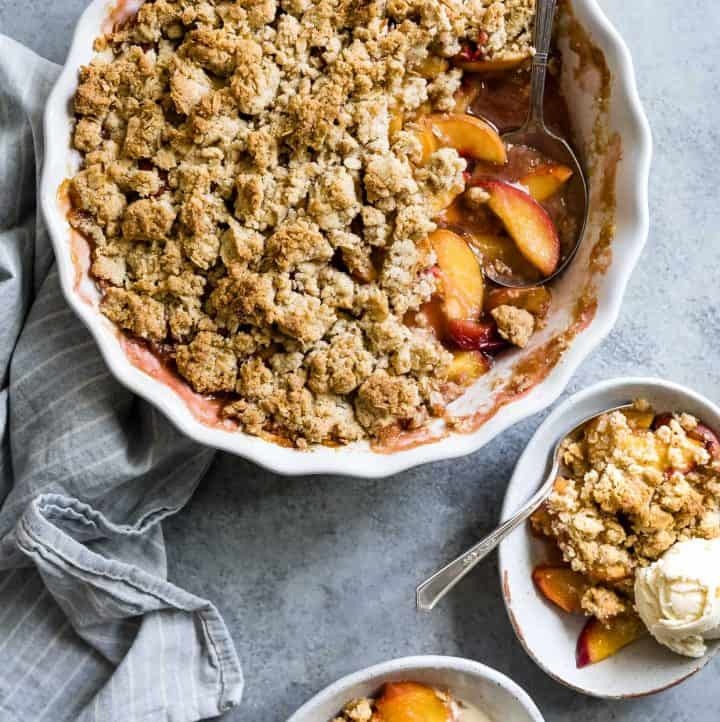 And I’m always looking for fall sweet recipes that go beyond just apples and pears!